- The NMRA Ford Nationals, the #1 all-Ford Motorsport show in the U.S., is pleased to announce its 2012 series event schedule. Next year's schedule includes familiar favorites and a new Maryland event that will bring awesome all-Ford racing to the mid-Atlantic region. For more information on the NMRA Ford Nationals log on to NMRA Digital or call (714) 444-2426. The NMRA Keystone Automotive Ford Nationals is running a free ticket giveaway for the 18th Annual Nitto Tire NMRA Spring Break Shootout March 1-4, 2012. We are reaching out to all of our sponsors and media friends to help promote this season’s opener. The ticket giveaway is being promoted on the NMRA Facebook Sweepstakes page, and it would be a tremendous help if we could have your social media department post an announcement directly to your Facebook wall so it is distributed throughout your network. This promotion begins February 1, 2012 and will end February 21, 2012. 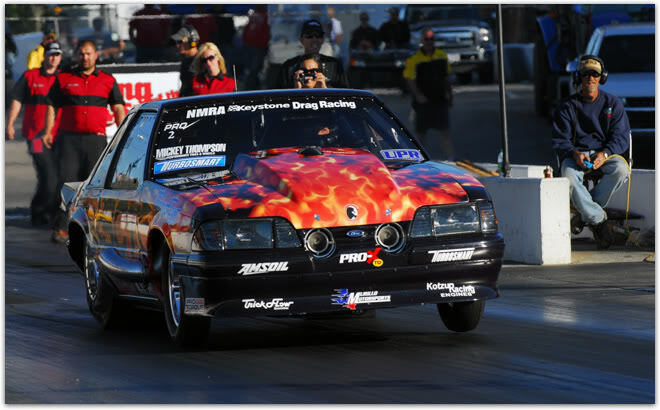 The NMRA Keystone Automotive Ford Nationals is proud to announce that Jacky Jones Ford & Ford Racing will sponsor a special Cobra Jet Showdown that will run at the Nitto Tire NMRA Spring Break Shootout event at Bradenton Motorsports Park in Bradenton, FL, the weekend of March 1-4, 2012. Watch as Cobra Jets from all around the U.S. converge on Bradenton Motorsports Park and set their combinations on kill for the prestigious title of Cobra Jet Showdown Champion! Jacky Jones Ford, the leading Cobra Jet dealer in the southeast and presenting sponsor of the Showdown, will be at the event with customer cars and a great display on NMRA’s huge manufacturers midway. "Cobra Jets have had amazing success on the track and truly showcase Blue Oval power. The Cobra Jet Showdown gives CJ owners another great opportunity to experience what their Cobra Jets can do,” said Steve Wolcott, NMRA’s CEO. “The NMRA Spring Break Shootout is the place to be for Ford racing fans…and the addition of the Ford Racing Cobra Jet Showdown further ads to an already incredible event. A big thank you to Jacky Jones Ford for sponsoring this class and supporting Cobra Jet owners around the U.S."
The class will qualify on Friday, and run on a Sportsman ladder with a .500 full tree for Saturday eliminations. The class will feature a $2,500 purse and the overall winner of the Showdown will receive $1,000, a custom jacket & award, and great exposure in national magazines like 5.0 Mustang & Super Fords, Muscle Mustangs & Fast Fords, and NMRA’s own Race Pages. For more information on the Cobra Jet Showdown including rules and purses log on to Bradenton, Florida – Event Preview | NMRA. Keystone Automotive, the leading distributorand marketer of specialty automotive equipment and accessories, will continue as the NMRA's series sponsor for the 2012 event season. Keystone's "support your local speed shop" campaign is near and dear to the NMRA as many of their speed & performance accounts participate with the series. Expect to see Keystone speed & performance customers on display as a part of NMRA's huge manufacturers midway at most events. Keystone has been the NMRA's series sponsor since 2007 and their dealer locator program, 1-800-AUTOPARTS, will continue as the official performance parts supplier of the NMRA Keystone Automotive Ford Nationals. ProCharger, one of the leading manufacturers of race and street superchargers, has renewed its Super Street Outlaw class sponsorship through the 2013 event season. Super Street Outlaw, also referred to as the "10 inch tire freak show" is arguably the most popular class in NMRA history. Running in the low 7-second zone at speeds upwards of 200 mph, SSO does it all on a super skinny true 10.5 tire! ProCharger is one of the leading manufacturers of supercharger systems for your musclecar, truck, boat and even motorcycle! One of the innovators of intercooled supercharger systems ProCharger isused by many of the top NMRA racers. Names like John Urist, Tim Matherly, Jason Lee and Jim Blair useProChager to win races and set records. For more information on ProCharger log on to ProCharger Superchargers, centrifugal supercharger kits for cars, trucks, motorcycles and marine applications.. The NMRA is pleased to announce that Strange Engineering will sponsor the all-new Coyote Stock class in 2012. Coyote Stock, which will be presented by 5.0 Mustang & Super Fords, will be a heads-up class where all competitors will compete is a Ford Racing sealed Coyote crate engine. 5.0 Mustang editor, Steve Turner, has long expressed the need for a more entry level heads-up class that can contain costs. NMRA believes that Strange Engineering Coyote Stock could become one of the most popular new NMRA classes in history. Strange Engineering is one of the leading manufacturers of driveline and suspension products including high performance rear ends, axles, brake systems, and more. 5.0 Mustang & Super Fords is one of the leading late-model Ford performance publications in the U.S. and has been a major NMRA sponsor since 2000. True Street has long been recognized as the ultimate street performance class and TREMEC has agreed to sponsor this NMRA category through the 2014 event season. True Street is open to street cars that are licensed, insured, and capable of driving on NMRA's 30-mile police-escorted cruise. After a brief cool down period True Street competitors then make 3 back-to-back passes and winner awards are presented to the closest averages to 9, 10, 11, 12, 13, 14, & 15 seconds (7 winners). Awards are also presented to the overall fastest winner and runner-up. Tremec Transmissions is the leading manufacturer of manual transmissions for your race car or muscle car. Long known for their T5, T56, TKO and TKO II transmissions, Tremec has just released the awesome, all new T56 Magnum. For more information on Tremec simply log on to Tremec. For more information on the NMRA Keystone Automotive Ford Nationals log on to NMRA or call 714-444-2426. For more information on the Cobra Jet Showdown including rules and purses log on to www.nmradigital.com/FL. Win Tickets to the NMCA Muscle Car Nationals Season Opener!